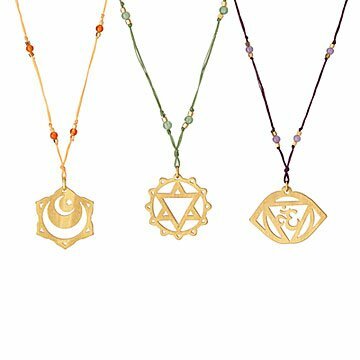 Ariana Ost's pendants feature intricate laser-cut details highlighting the beauty of each chakra symbol. Hindus and Buddhists believe that our bodies contain seven chakras—crown to root—and that if these "energy centers" all align, we're feeling pretty fantastic. Ariana Ost has created modern pendants for them all, with intricate laser-cut details that highlight the beauty of each symbol. To complete the look, she's paired a complementary semi-precious stone and high-quality silk thread. Choose your favorite chakra, or one you'd like to focus on more. Layer with other pieces or wear alone as a reminder to be mindful and seek harmony in the everyday. Handmade from brass in New York City.